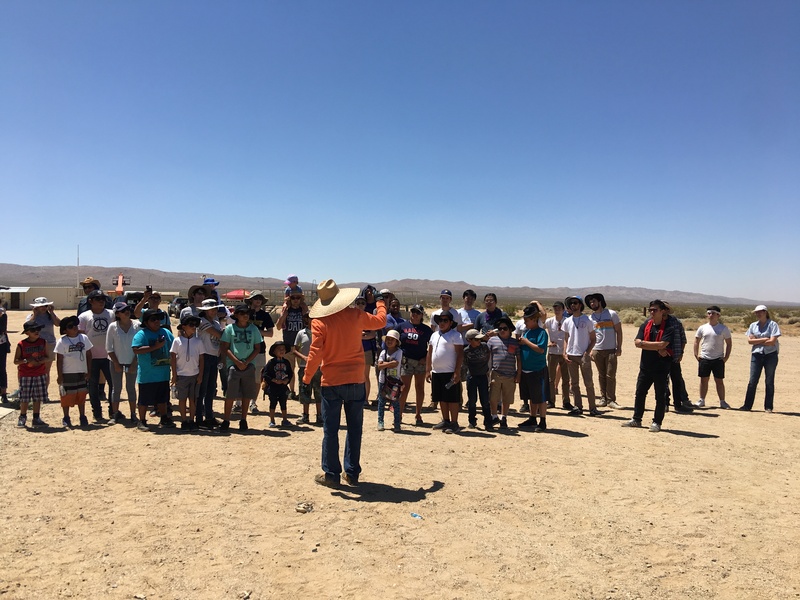 The RRS hosted a launch event on Saturday, July 22, 2017, with the students of Jordan Downs, sponsored by the Los Angeles Police Department’s (LAPD) Community Safety Program (CSP) at our Mojave Test Area (MTA). This launch event was the final part of the educational program put on by the RRS. The event was very successful as we fired 10 student alpha rockets and one more alpha from LAPD. 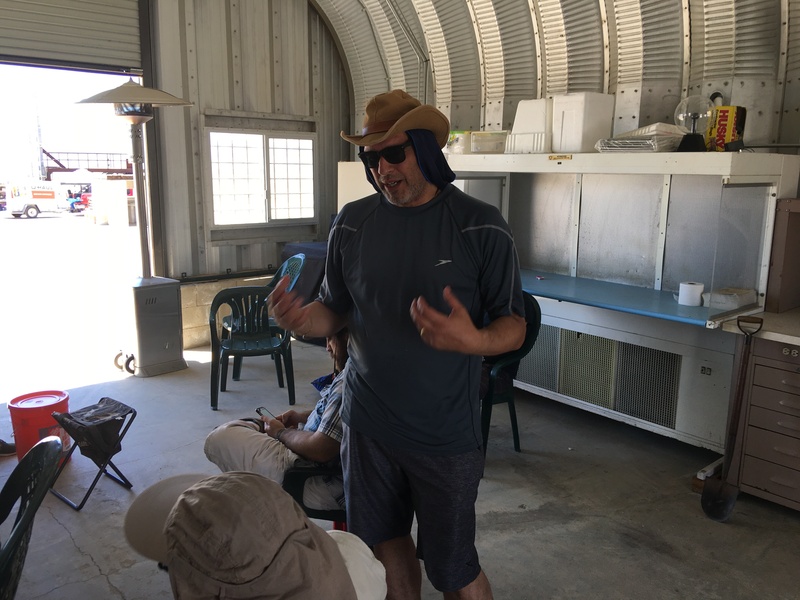 It was a typically hot day (105 F / 41 C) for late July at our private test site the Mojave Desert, but everyone was well prepared. Some even brought umbrellas which was a great idea to stay out of the sun’s rays. The misting fan we bought from Home Depot seemed to work well in the observation bunker. Home Depot was also very kind to donate water misting bottles for this event which helped tremendously in keeping people cool. RRS treasurer, Chris Lujan, was also very well prepared for the event as he saved me with a cold water bottle just after launch. Looking after each other is what we do. Our pyro-op in charge was Dave Crisalli and he gave our safety briefing before we got started. The students were well prepared and seemed to get a lot from it. New RRS member, Alistair Martin was nice enough to film some of the briefing. We also gave a propellant burn demonstration after the safety briefing to give everyone an appreciation for the power of the chemicals commonly used in amateur and professional rocketry. I have a still of the sample composite grain below. I took a video of the composite burn and will have it posted on our YouTube channel very soon. Larry and Osvaldo had already loaded the rockets the night before so we could get the event started as quickly as possible. The rockets were safely stored in our old blockhouse ready to go. 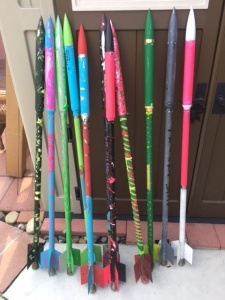 Each of the students had painted their rocket with a unique pattern and color scheme to better help identify them later. The photo below is from just after the build event. Dave allowed me to assist on the pyro-op duties including rail loading and connecting for firing. As promised, we worked quickly to call out each one as they were loaded in the rails. Dave and I worked very efficiently to get each one off swiftly and safely. The LAPD rocket was the 11th one in the series. It had a few special features including a smoke tracer in the payload section and a tail-fin mounted camera. 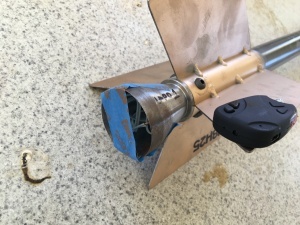 The LAPD rocket was able to be recovered shortly after launch thanks to the smoke tracker. 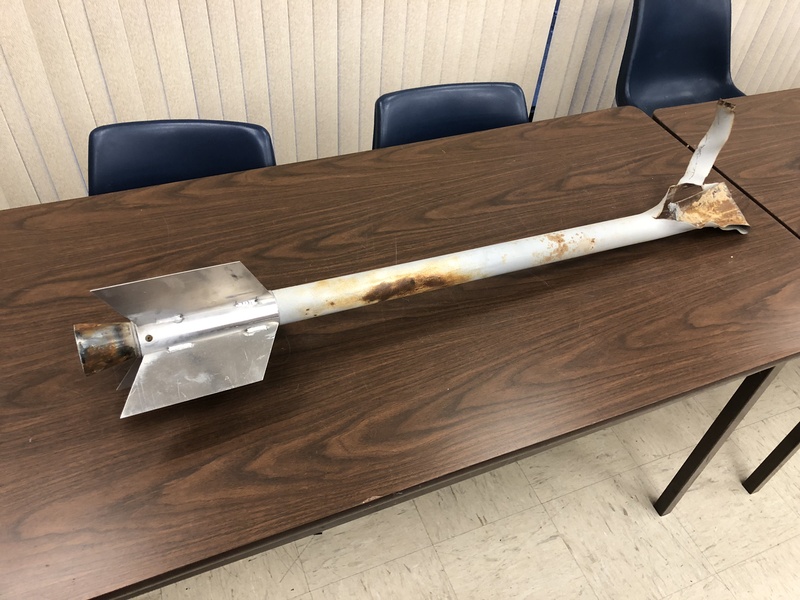 The nose cone wasn’t able to be recovered but the camera on the tail fin remained in tact. We have had good luck with one of these keychain cameras in the past. Although the camera imparts a spin on the rocket, the flight is very stable. Once the footage is downloaded, and depending on the quality, the RRS will post it on our YouTube channel. It should be a lot of fun to see (fingers crossed). The specific brand of smoke tracker used was “Enola Gaye”. Given the success of the flight, the RRS should certainly use more of this product in the future. There has been some discussion to increase the number of holes in the payload section to allow more of the smoke product to escape throughout the flight. Due to the summer heat, the students of Jordan Downs didn’t go downrange to search for their rockets after the launching was over. 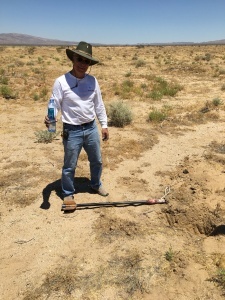 However, Frank was able to locate and recover (dig up) one from the event. 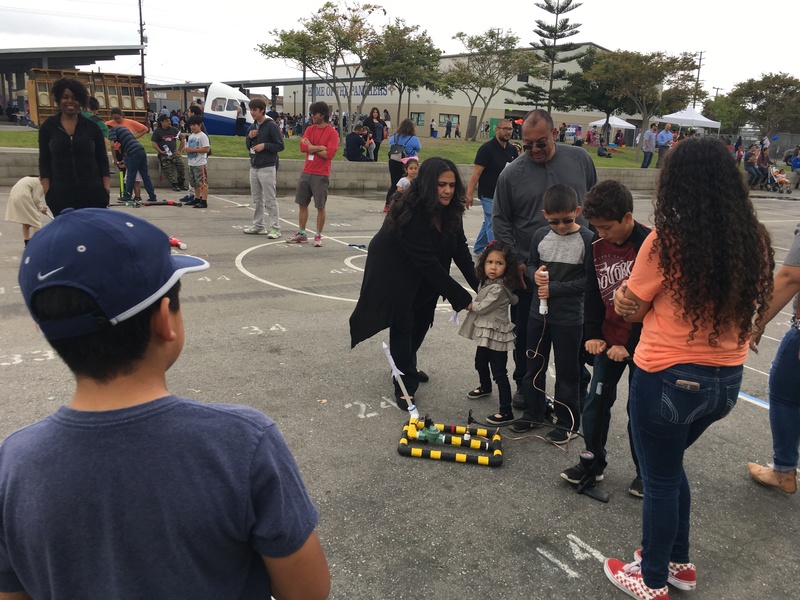 The RRS is grateful to all of the parents and adults who supported the event with us. 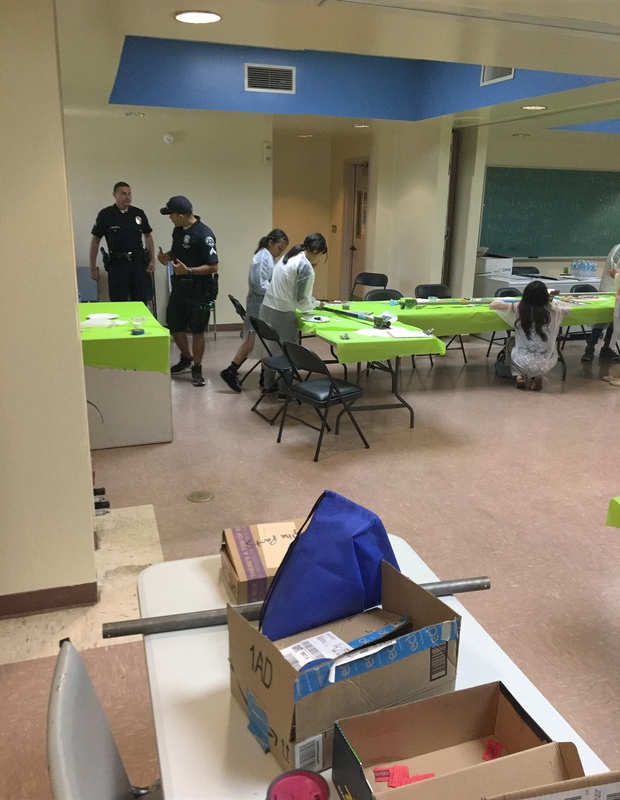 Also, the RRS is grateful to LAPD officers, Acuna, Plascencia and Terrazas, for their help in making this event a big success. 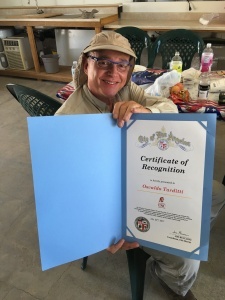 University of Southern California (USC) and RRS president, Osvaldo Tarditti, were glad to receive a certificate of recognition from L.A. City Councilman, Joe Buscaino of the 15th district for putting on this event with the students of Jordan Downs in Watts. 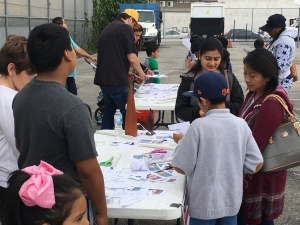 It is with gratitude that the RRS accepts the certificate and we hope to work again with the students of Jordan Downs and other groups in the city. As for my own rocket which would have been the 12th alpha launched, an electrical problem with the timer forced me to pass on launch. 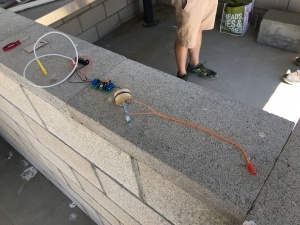 Although each part of the circuit seemed to work individually when I tested them the night before, the fully integrated system failed the demonstration at the site. Working with Richard and with some more time, I can resolve the issue, improve the design a little, and fly the parachute system in the alpha at the next launch event. 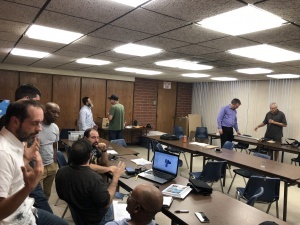 UCLA was also at the MTA to continue their work on their liquid rocket project. UCLA proceeded after the Jordan Downs launch, but had an electrical problem which prevented their scheduled cold flow testing. UCLA hopes to reset their efforts and be back at the MTA for more testing in late August. Chris, Richard and I discussed making some rocket candy (sugar/KNO3) at the MTA loading area, but it seemed that there wasn’t enough time to get things started. With most of the resources already on hand, we’ll wait for the next event for Chris to cook a small batch of this classic amateur rocketry compound for demonstration purposes. Or comment to this posting below. Also, if I have missed or misstated anything, please let me know. 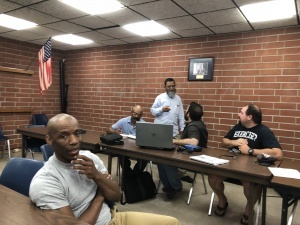 Our next monthly meeting will be August 11th at the Ken Nakaoka Community Center in Gardena, CA. 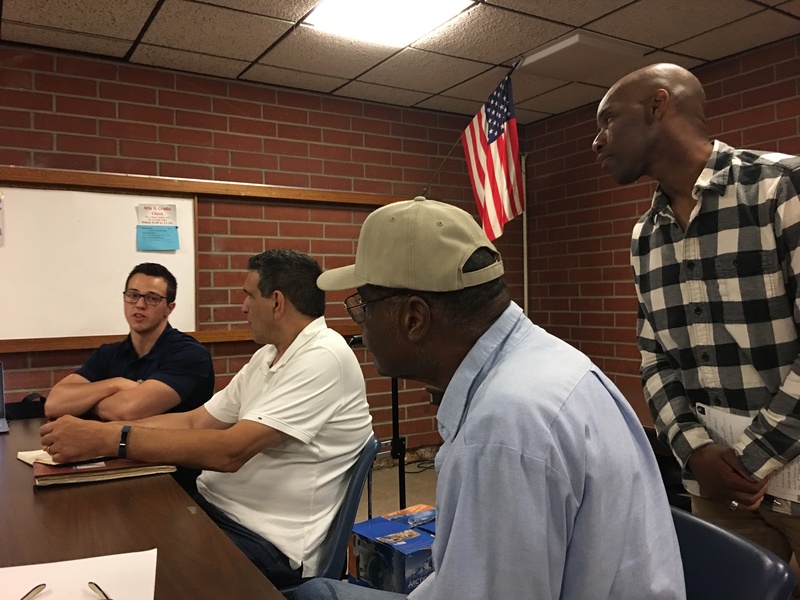 The RRS held its monthly meeting last night on July 14, 2017 at our usual spot at the Ken Nakaoka Community Center in Gardena, CA. We got started a little late, but we covered all of our agenda items. We have two new members, Drew Cortopassi and Alastair Martin, joining the RRS. Both were in attendance at the meeting and we were glad to have them join us. Larry gave us an update on the RRS alpha build event we’re doing with the students of Jordan Downs in Watts. 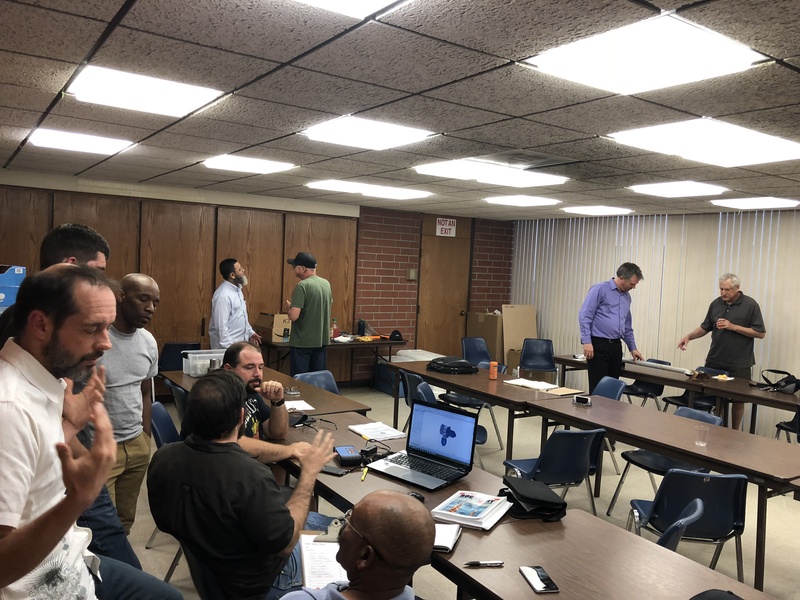 John Mariano gave his presentation last week and Larry has started the build event portion. This event has been sponsored by the Los Angeles Police Department’s Community Safety Partnership (CSP) which will be bringing a lot of talented kids from the inner city of Los Angeles. 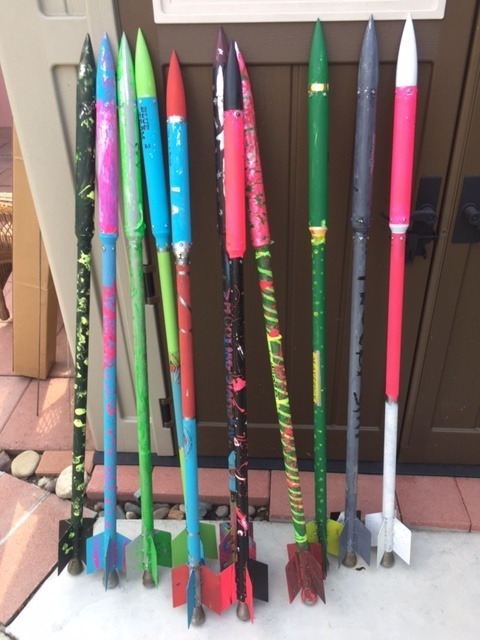 Local television crews filmed the event and the final day of painting of the student rockets is happening today. We hope to have the video spot on our YouTube channel very soon. The students from Jordan Downs will launch 10 alpha rockets with one more alpha launched by LAPD. It will be a great day next Saturday, July 22nd, at the MTA. 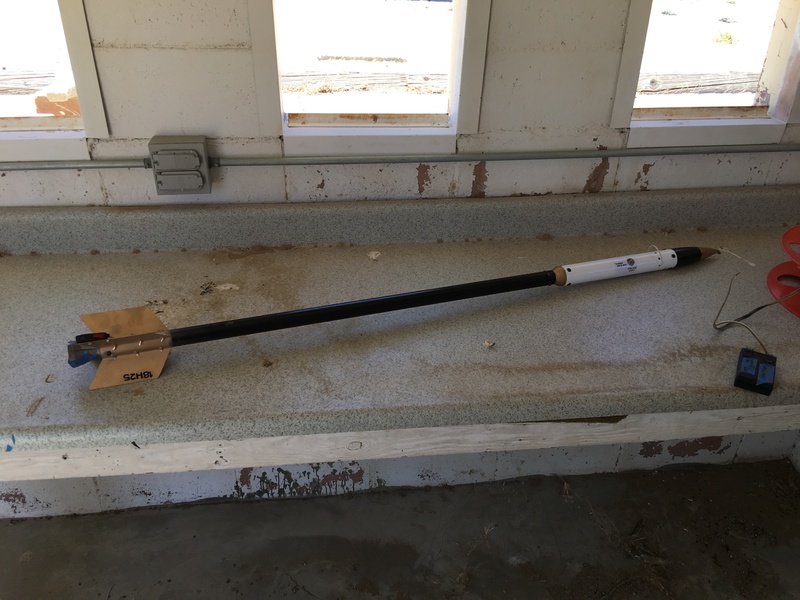 I will be launching an alpha of my own at the event with a PVC payload section. Our director of research, Richard Garcia, and RRS treasurer, Chris Lujan, were helping me with some payload issues I’m resolving. 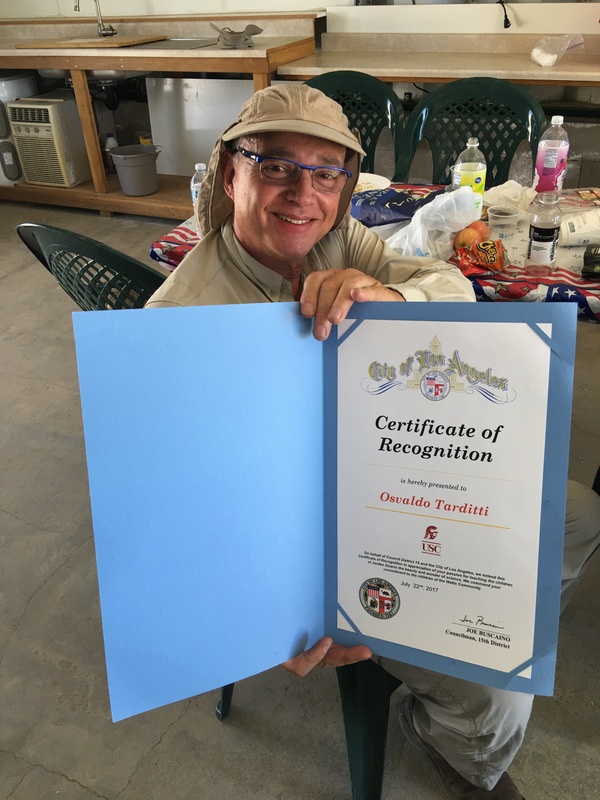 Dave Crisalli has also been working with students at the Chaminade College Preparatory School in Chatsworth, CA. 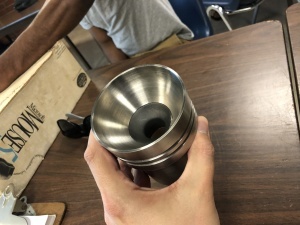 They have built a solid rocket motor to test at the MTA on the July 22nd event. Dave was a graduate of Chaminade and has been our pyro-op on many MTA launch events. Our discussion moved to the details of managing the upcoming launch event at our Mojave Test Area (MTA) on next Saturday, July 22nd. This is a private event, but we host these with many students, universities and private individuals with our membership. We had discussed how the launches should be conducted as early as possible to avoid what will likely be an oppressively hot summer day for our young students. All of our invited attendees should make an extra effort to be at the MTA by 10:00AM, which means leaving the city before 7:00AM. There were also concerns related to safety once we get into launch mode. 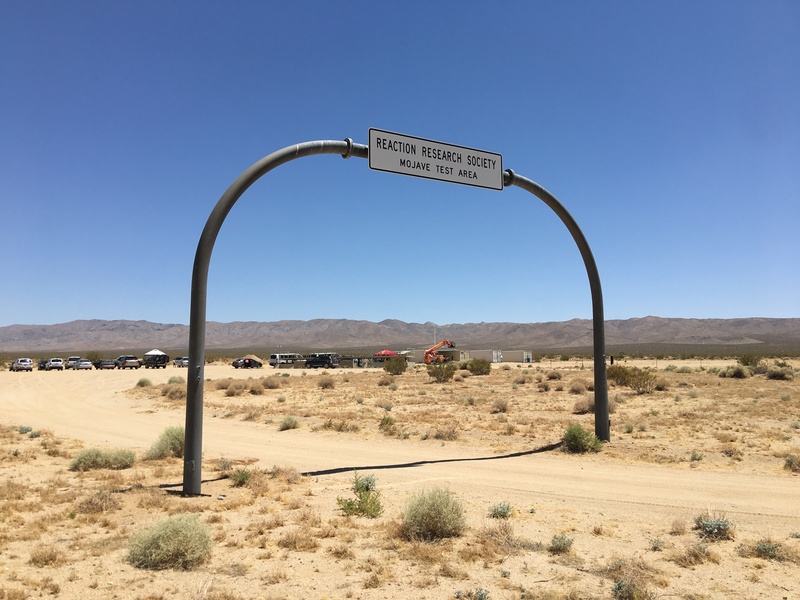 Once the safety briefing is conducted (likely around 11:00AM) and all people are moved into the observation bunker, the roads will be closed to traffic. No one will be allowed in or out until the last volley is fired as is our policy. Attendees at the MTA are recommended to wear hats and sunscreen at all times. Bring as much ice and water as you can. And most importantly…drink this water and fluids as often as possible. Many people don’t know they have become dehydrated until after the ill-effects set in (then its too late). Drink often even if you don’t feel like it. I gave a short update on the SuperDosa project. We have decided to build a ballistic evaluation motor (BEM) to have the ability to conduct propellant evaluation tests. There are a few different approaches to getting accurate burn rate data, but I felt that the BEM approach would be the most beneficial despite the added complexity. 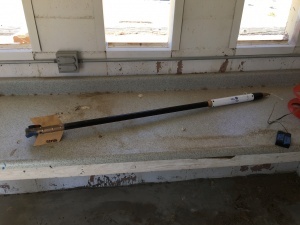 Osvaldo has the plate and round stock I bought for this small but tough little test rig. 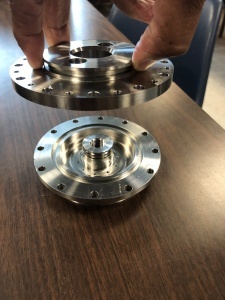 Richard Garcia is working on the dust recovery and ducting to restart his graphite machining capabilities. 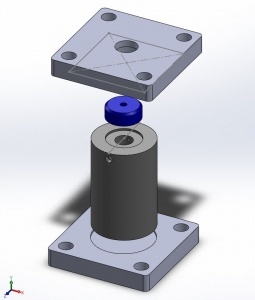 I hope to get a few nozzle pucks made and hopefully begin testing this fall. More work in trajectory and performance modelling needs to be done. The details on the initial SuperDosa design are still a bit in flux. Neither Richard nor I had any progress to report on this front. The discussion moved to propellant procurement. We are looking at acquiring some AP oxidizer which shouldn’t be a problem. The HTPB binder chemical, however, has really climbed up in cost. PBAN is another option we’re considering. Someone mentioned asphalt was used in the early days, but it’s not clear what the disadvantages are. We had briefly discussed making rocket candy just for the initial samples to test and qualify the BEM test rig. 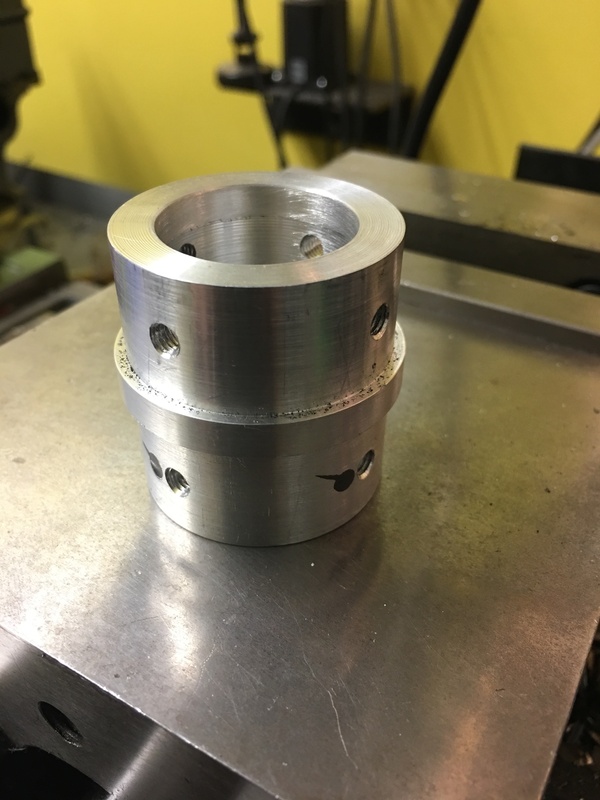 It was decided that Chris Lujan would cook a small batch of sugar/KNO3 at the MTA and pour into some 3/4″ PVC sample cases. I hope to be able to document the process and present this in a report. This is a common mixture, but the purpose is to help more people become better at this task. Many of our members have experience in making the rocket candy mixture, but it helps to standardize the process and always watch out for safety issues. MIT student, Sean Austin, was in attendance at the meeting. He had mentioned his university lab had built a strand-burner to test propellant samples. They had a lot of issues getting reliable test results, but he was happy to share their design with the RRS. 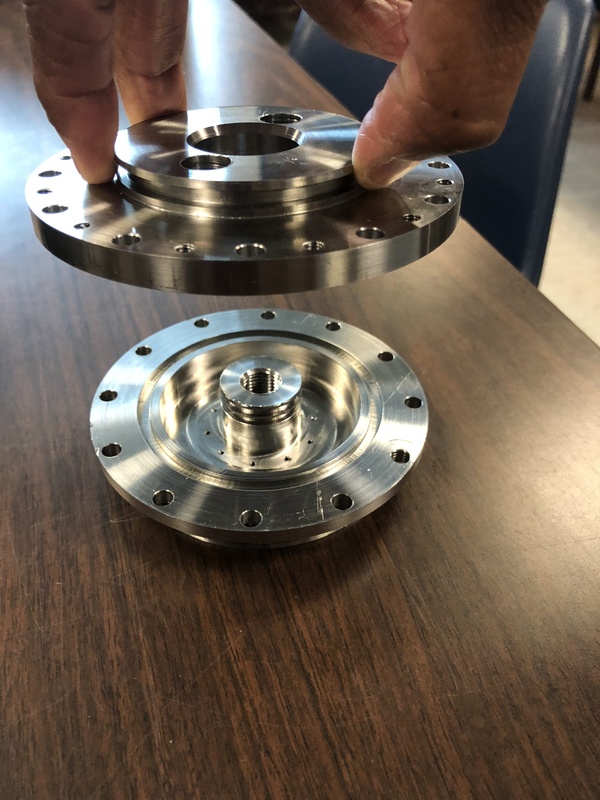 A strand burner design is simpler to make and if the RRS has the right materials and tools, we may build a strand burner to supplement our BEM. Richard Nakka’s rocketry page has a lot of great details on this subject of solid propellant burn rate testing methods and data collection. 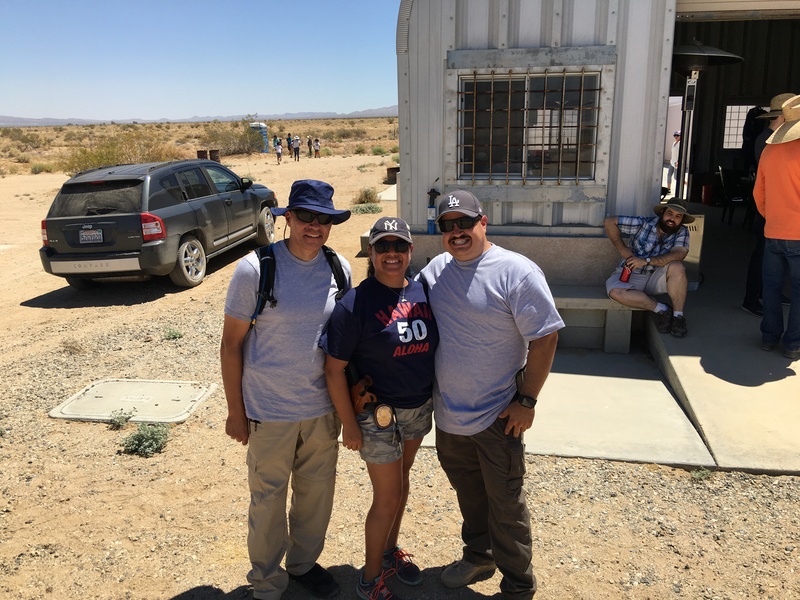 Four members from the UCLA IREC team came to present their results from this year’s competition at Spaceport America north of Las Cruces, New Mexico. 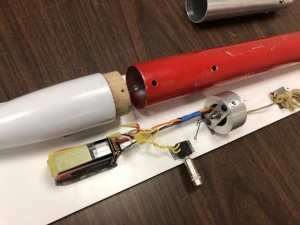 The rocket launch competition is supported by universities across the country and the event is managed by the Experimental Sounding Rocket Association (ESRA). I had asked UCLA to come show us the fruits of their team’s hard work done at the RRS MTA. 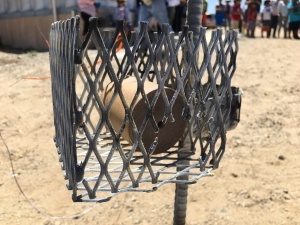 UCLA had some issues resolved, but ran into other problems at the launch site. Heat was a factor which resulted in the payload computers not working. A great deal was learned and UCLA will surely leverage these lessons into next year’s build. 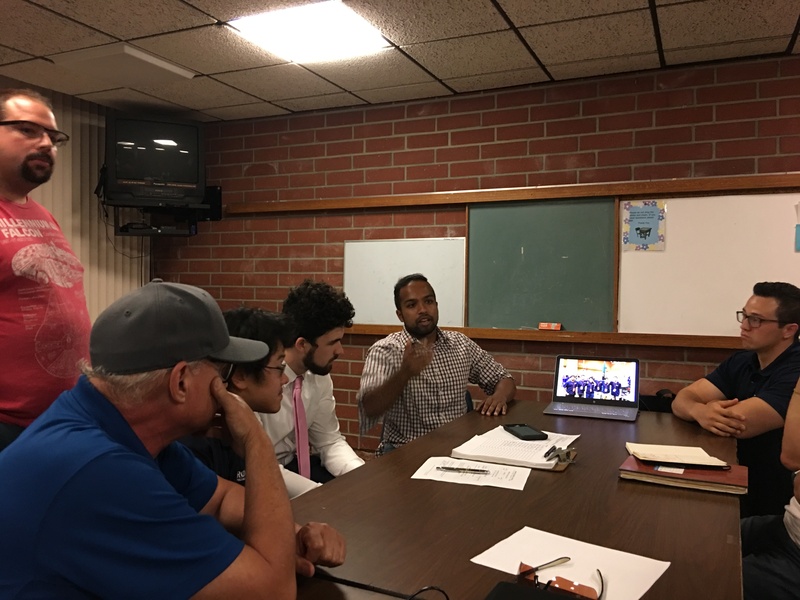 The RRS would like to thank UCLA students, Nakul Gupta, Caleb Lessard, Edward Shen and Nick Knenning for presenting. The RRS looks forward to continuing our support of UCLA and other universities as they advance their rocket projects. 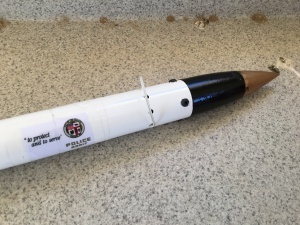 The UCLA Rocket Project will conduct more cold flow testing of their liquid rocket systems at the RRS MTA at the July 22nd event, but priority will be given to the student alpha launches to conduct the events as early in the day to avoid the hottest hours at the site. Also, in attendance at the meeting was MIT student, Sam Austin. Sam is in Los Angeles this summer on an internship with Northrop Grumman. Sam was part of the MIT team at the IREC competition and related some of his team’s results. MIT did well taking 2nd place, but as always, there are new things to learn or things to do better. Sam had indicated interest in attending the upcoming launch at the MTA. We hope he’ll become a student member of the RRS to do so. The RRS history project continues as our current membership has been reaching out to our founders and other members from the earliest days of the society. We hope to share some of this with our readers and members very soon. Frank had found another set of RRS newsletters from 1989-1991 which he gave to Richard Garcia, our director of research, for scanning and archiving. I had presented the general topic of how to generate more revenue for the society. The RRS is funded by our membership in the form of dues, donated time to support events, monetary and material donations and such. I wanted to solicit ideas about how the RRS can pursue other avenues to bring in more funds to better support the programs we have and the new programs we hope to do soon. One classic idea is to produce RRS-logo branded things like T-shirts, coffee cups, even metal rulers. I have seen older RRS branded items in the past and although the profit margins can be thin, it’s a fine fund-raising idea to consider. John Mariano had a few other ideas for fund-raising he brought up in a previous meeting this year. The RRS is looking at grant programs both in the private sector and with government agencies. 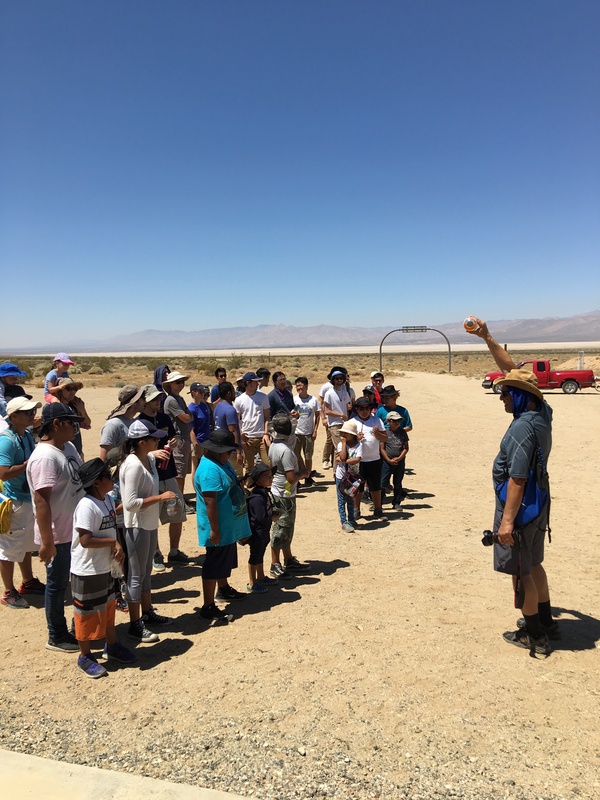 The RRS is a 501(c)3 educational non-profit group which has had success with several schools already and we intend to expand our outreach as we find schools and organizations able to help us bring the joy of rocketry. Donations from private companies and individuals is another avenue we’ll pursue. If anyone has any specific programs or ideas in mind, please contact the RRS vice president, Frank Miuccio. 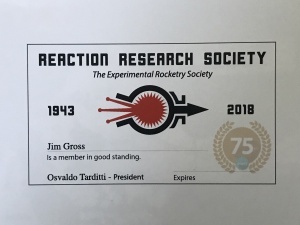 One idea I had which was accepted was to publish an issue of the RRS Astrojet newsletter on our 75th anniversary on January 7, 2018. Although the RRS has not published a paper newsletter in quite some time, it was a popular item in its day. The newsletter would be the same 12 page format used throughout our history with articles from many of our members including George James, George Dosa and others as we bring this idea home. The 75th anniversary Astrojet newsletter will only be available in print and delivered by mail for a nominal price ($10?) to help fund the RRS’s growing activities. Another idea put forth was to attempt the rocket mail flights done in the early days of the society. More thought and discussion would be necessary to see how feasible this would be, but I liked the idea? The RRS may look to have some corporate sponsorship of the 75th anniversary symposium if this is possible. Frank made the announcement of the upcoming 75th anniversary RRS symposium on April 14, 2018. This will be a public event at the Ken Nakaoka Community Center where we will have speakers from universities, government agencies and private companies. Frank also mentioned that he’ll be taking a trip to JPL with RRS founder, George James, later this month. Besides a tour, the RRS hopes to have a conversation with the K-12 education outreach coordinator at JPL on this visit. Frank will post an update on the website after this event. We adjourned late, 9:20PM, well after the 9PM closing time, but we covered a lot. If there is anything I missed or misstated, please contact me at my RRS email below. 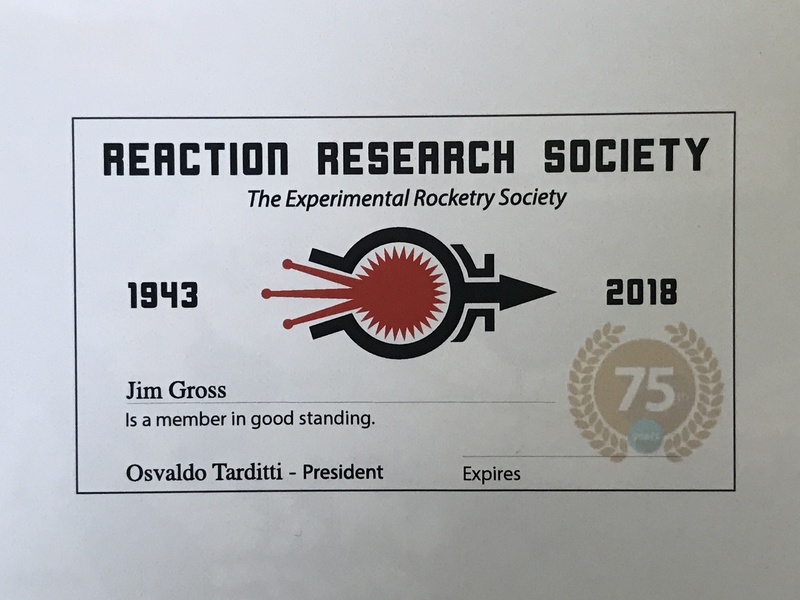 For those desiring to apply to join the RRS, either as full members or as student members, download our RRS membership application form from this website and send it to the RRS by email or our post office box in Los Angeles. Our next meeting will be August 11, 2017, at the Ken Nakaoka Community Center.